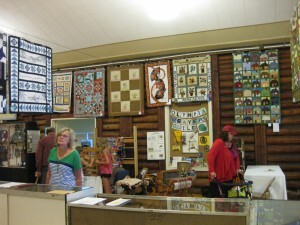 The Harbor History Museum’s newest temporary exhibit “NWxSE: A Collaborative Small Tapestry Project of Northwest and Southeast Weavers” opens on September 15, 2012. 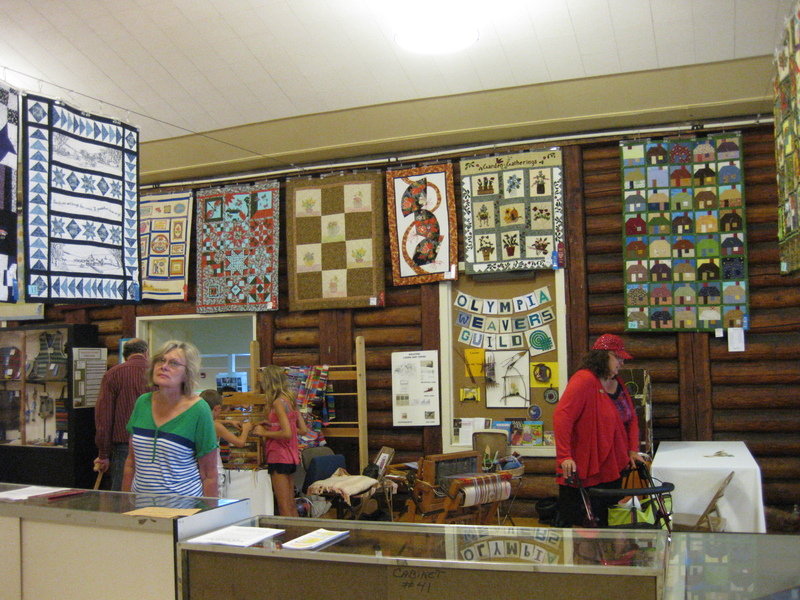 This cross-country exhibit showcases the works of weaving artists from Puget Sound (“NW”) and the southeast United States (“SE). The exhibit runs through January 20, 2013. More than 40 small tapestry pieces will be on display, showcasing the incredible talents of tapestry weavers from Tapestry Weavers South and Tapestry Artists of Puget Sound (TAPS). Internationally known weaver Cecilia Blomberg will be demonstrating tapestry weaving on the exhibit’s opening day, Saturday, September 15, from 1 to 2 pm. The small tapestry format is conducive to experimentation for the contemporary weaver. Small tapestries tend to be of finer quality than large ones, and are more time consuming to weave. Smaller tapestries also provide the opportunity to appreciate the workmanship close-up while larger tapestries are observed from a farther distance in order to see the whole design. Smaller works also feel more intimate to the viewer. The two tapestry groups joined forces to develop this collaborative project. The goal was to present a wide variety of work while restricting tapestry artists to the same format. The exhibit first opened at the Gaston County Museum of Art and History in Dallas, North Carolina on Feb.18, 2012. In addition to the tapestries, museum visitors can watch videos showing the complex process involved and the skills needed by the weavers to create their woven works of art. Hands-on activities will provide an opportunity for exhibit visitors to try their hand at tapestry weaving. In addition to the small tapestries in the Special Exhibitions Gallery, local weavers from TAPS will display larger tapestries in the museum lobby. The museum is open Tuesday through Sunday 10 am to 5 pm. Visit www.harborhistorymuseum.org for more information on this new exhibit and other exhibits in the museum. The Gig Harbor Peninsula Historical Society, dba Harbor History Museum, was founded in 1963, and opened a museum in 1973. Our mission is to create opportunities to experience the heritage of the greater Gig Harbor communities. We do this by collecting, preserving, and sharing this area’s history. The museum is open April 16-January 31, Tues-Sun, 10am-5pm, except major holidays; winter hours are February 1-April 15, Weds-Sat 10am-4pm, Sundays 12pm-4pm. 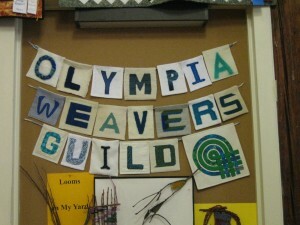 Portland Weavers Guild is hosting a 2 day Workshop on Collapse Weave, presented by Anne Field. Anne literally wrote the book on this artistic design structure. Google her to see what she brings to the subject. To gain personal experience with how such highly textured cloth is achieved, consider joining the workshop, scheduled for Friday and Saturday, October 12 and 13 in the Portland area. The letters we wove to spell out our name has been assembled as a banner and is hanging in our space at the Fair. 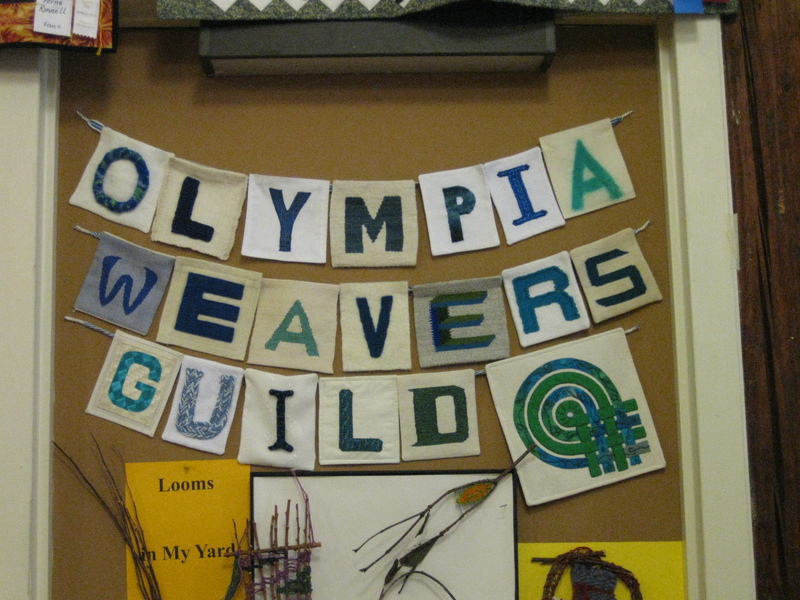 All letters and bands were handwoven by members of the Olympia Weavers Guild. Olympia Weavers Guild display at the 2012 Thurston County Fair.